For the private sector, a newly restructured set of relationships with government (whether as regulator, counterparty, vendor or partner) could be equally profound. McKinsey identifies the "rise of the market state" as one of the five global forces that are rewriting the list of opportunities and challenges facing business. We agree with the McKinsey view that government is likely to play an even larger role in the next decade. And we think 2012 will be a year in which governments will be key players in driving M&A activity in Canada, the United States and around the world. infrastructure investment through public-private partnerships (PPPs). Tough fiscal environments often generate the loudest calls, from both inside and outside government, urging privatization through asset sales. Today, investors – both strategic and financial – are carefully monitoring opportunities for government assets to be put on the block in the PIIGS countries – Portugal, Italy, Ireland, Greece and Spain. Other countries, including Canada, Australia, the United Kingdom and the United States, are openly discussing privatizations – and not just on a one-off basis, but through implementing programs that will enable them to systematically identify assets that may be appropriate for divestment. Privatization is not just a national phenomenon. States, provinces, municipalities and cities are also looking at monetizing mature infrastructure assets to get their fiscal feet back under them. Privatization is a permanent disposition and can be accomplished through different processes, including private sales, auctions and initial public offerings. 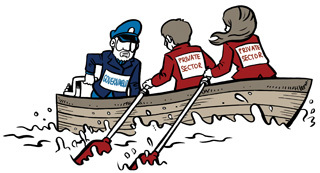 Privatization often involves a companion exercise to clearly define the privatized activity: bundling similar businesses, commercializing a distinct business or carving out minority stakes or individual assets (such as power plants or transmission lines from a large utility). There will be no lack of capable and funded buyers for these government-held assets – particularly the dependable income-generating infrastructure assets and businesses that are thought of as being recession-proof. As an alternative to outright privatization, governments could opt to enter into arrangements with the private sector that are of limited scope and duration. Joint ventures can involve shared public and private ownership, with an objective to improve operating performance. Concessions grant a private partner a limited duration right to carry on a government business for a fee, transferring the responsibility for capital investment. In either case, the transaction preserves public ownership and defers the decision on whether a full privatization would ultimately be desirable. Governments have also been turning to the private sector to provide some of the services that were historically directly provided through a government monopoly. For example, a number of U.S. states and Canadian provinces already permit private market competition for liquor sales and gaming facilities, within regulatory parameters set by government. Despite fiscal pressures, governments recognize the need to continue to invest in infrastructure, both to remedy a significant infrastructure deficit and to create a context that will attract business investment, driving economic growth and ultimately stabilizing tax revenue. Governments frequently turn to PPP or alternative financing and procurement (AFP) transactions to design, build, finance, maintain and/or operate new infrastructure; distribute the cost of new infrastructure across decades; manage life cycle costs; transfer significant project and financial risks to the private partner; and preserve public ownership where appropriate. Canada has developed a very active market in these PPP transactions in the past decade and is now one of the most active markets globally, with approximately 160 such transactions currently underway. The United States is less active currently, but is developing a legislative framework in multiple states and will likely become more active. The United States has seen some monetization of mature toll roads and bridges. Canada has a young PPP market, and restrictions on equity transfers for one or two years following “substantial completion” have limited the secondary market in PPP equity to date. That may change in 2012 as more projects become more easily tradable under the underlying project agreements. Interest in this area is growing among pension funds and other deep capital pools, and a number of listed and unlisted European funds have been established to recapitalize captive and third-party equity interests in PPP contracts. Process. Government M&A processes need to be clear and well-communicated, often to the general public as well as to the transaction participants. Transparency of process is increasingly important to governments, market participants and the public. No one wants surprises, and an even playing field for transaction participants is seen as critical. These processes can affect the speed of transactions and the way in which they are planned, negotiated and consummated. Asset assessment. Assessment of the quality of, and risks associated with, government-held assets and services and (in some types of transactions) cash flow will be important. This is particularly difficult when assets and businesses are being carved out of other enterprises to be privatized or will be the subject of a new regulatory framework. Regulatory and legislative framework. In privatization transactions involving the sale of mature government assets, a new (or expanded) regulatory regime may need to be established (particularly in the context of a natural or government-created monopoly) to ensure that the new owners (or concessionaires) can suitably prosper – but at an appropriate price to the public. Adequate regulatory structures need to be in place to ensure that both consumer and government interests are protected. This can be tricky and time-consuming. Similarly, legislation may be required to effect some transactions, which can be particularly challenging for a minority government. Revenue use. Governments need to have clearly enunciated uses for the revenues their transactions will generate and, in some cases, a method for “locking in” what happens with the revenue. Deals will need to be structured or marketed with these revenue requirements in mind. It’s not just about money. While a government needs to ensure that fair value is realized for its taxpayers, it often has other measures of success it is looking to achieve, such as ensuring that the transaction will generate additional long-term economic activity within its borders. Savvy private sector participants will be aware of and consider these hot buttons early in the process. Dealing with the public. Government M&A transactions are evaluated in the court of public opinion and not strictly on a financial basis. Communications plans and marketing activities are all the more strategically important to government parties and can drive some unusual transaction features, including those meant to reward taxpayers and build support.